Elections are about numbers. Democratic politics is about stitching together a majority. So, the larger a group, the bigger is its “vote bank”, and greater is its electoral clout. 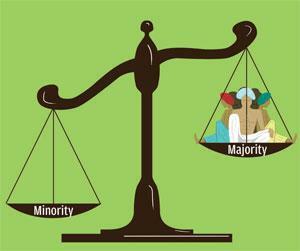 A social group that constitutes a majority can therefore dictate its terms in an electoral democracy. Or so they say. And so they teach in democratic theory. If we go by this orthodoxy, farmers should have unmatched electoral clout in India. After all, they constitute a clear majority. Census tells us that farmers (including agriculture labour) are about 54 per cent of our workforce. In the last parliamentary election, 542 million of the 834 million voters were rural voters—farmers and those dependent on agrarian economy. All available evidence indicates that they vote at least as much, if not more, than other classes such as industrial workers or urban middle classes. Yet we know that they do not matter. Elections are not fought around farmers’ issues. Party manifestos make a fleeting, often rhetorical, reference to farmers. Once elected, parties conveniently forget their promises. Democratically-elected governments do not bother about farmers. The Union government in the 2017-18 budget allocated just 11 per cent of its expenditure to the entire rural sector, including Mahatma Gandhi National Rural Employment Guarantee Act or MGNREGA, rural housing, crop insurance, irrigation, roads, fertilisers and all. Speak to ordinary farmers and they hardly sound like sovereign voters. Farmers are nobodies, resigned to being used and thrown. Here is a majority that is routinely excluded, if not trampled upon. What explains this paradox? First, there is a problem of awareness among the farmers. They face distress but often blame themselves, nature or fate for this condition. It takes a lot for a farmer to connect his condition to state policies and to think that it can be redressed by governmental action. While there is a desire for change in their own lot, it is often not directed towards the government. The second problem is an aggregation of individual desires into a collective demand. Farmers have historically remained divided along multiple layers—class divisions between land-owning peasant-proprietor, sharecropper and farm labour—and political divisions across states and parties have fragmented the voice of farmers and hampered collective action. The third, and perhaps, the biggest problem is the articulation of farmers’ demands in the public sphere. The nature of modern mass media in India is such that it masks the farmers’ issue, along with many other issues that do not connect to its principal consumers, the urban middle classes. The indifference of the dominant English media takes the form of downscaling and masking of farmer-related issues. The bigger but subservient media in the Indian languages ends up localising the farmers’ news. The combined effect is catastrophic: informed urban Indians did not know about the severe drought that devastated the country in 2015 till a cricket match was stopped due to shortage of water! Fourth, the character of farmers’ organisations has prevented an effective advocacy of the farmers’ cause. Farmer organisations have tended to be episodic, personcentred, short-lived and localised, and low on policy content. Unlike trade unions, national level coordinated action by farmer organisations is almost unheard of. This seriously hampers their capacity to drive a good bargain. Finally, the functioning of our political system frustrates any effective profarmer action. In a democracy centred only around elections, there are very few instruments for holding the government accountable in-between elections, for scrutinising electoral promises and their implementation. Lack of inner-party democracy makes it very hard for farmer organisations attached to parties and unattached movement groups to pressurise party leadership and hold it accountable. Poor quality of parliamentary debates also allow the government of the day to escape serious scrutiny. This vacuum in democratic governance is exploited by vested interests. As a result, there is a lot of political rhetoric about farmers, but very little political will to rescue them from the deep crisis. (This article was first published in December 16-31 issue of Down To Earth under the headline 'Paradox of an excluded majority'). I saw a video of Yogendra Yadav in which he was telling a TV channel that he is organizing ALL the farmers' organizations of the country under one umbrella. That will surely help in consolidating the vote of 540 rural folks under one banner. However, the main political parties - Congress and the BJP will continue to play their nefarious political games in the 2019 Lok Sabha elections, which are most likely to be held in November 2018 by the way. Congress and it's acolytes like Jignesh Mevani will play the Dalit card and create havoc with India's peace. In a recent drama he created on Parliament Street, Jignesh Mevani was sitting on a large white sofa fiddling with his smart phone. So much for the well being of his fellow Dalits who were still under the duress of the other Indians. The BJP will play the Hindutva card when it becomes necessary to sway the voters. It will be huge challenge for the Swaraj Abhiyan will stop its 540 million rural voters from being fragmented by the Congress and the BJP. Therefore, it is my humble suggestion, that the Swaraj Abhiyan needs to also start looking at making inroads into urban but poor voters - the construction workers, daily wage earners, household helpers, domestic drivers, taxi drivers, rickshaw pullers - the WHOLE OT if it is to have a realistic chance of winning in 2019.